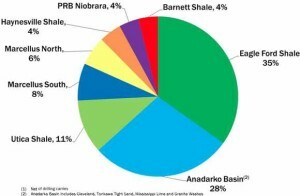 Chesapeake's Eagle Ford production grew 266% in 2012 to 143,200 gross operated (62,500 net) boe/d in the fourth quarter. Chesapeake plans to drill fewer Eagle Ford wells in 2013 than in 2012; however, the planned number of wells turned-to-sales will be roughly equal in both years. It was just August of 2012, when CHK Planned for 22 Rigs in 2013. The latest step down is likely the reflection of more conservative development plans that will be implemented by new management. Most of what the company considers "core" or " tier 1" acreage will be held by production at year-end 2013.